"Thank you, Puchong". Karpal Singh's son Gobind has put up his first posting since winning the Parliamentary seat in Puchong at the General Election on March 8. He said he'll update regularly. I first met Gobind last December at a bus station in front of the Bukit Aman police station. 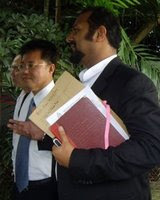 He had earlier accompanied blogger Jeff Ooi, as the blogger's lawyer, to meet some CCID officers over a police report against Jeff for something he said on Aljazeera. Ah, did we think that both Gobind and Jeff would, three months later, ride a Rocket to Parliament? Click H E R E to go to Gobind's blog. All well and swell Rocky but being a resident in Puchong, I am still waiting on the Gobind's "response" on his pre-election statement of working on the toll surrounding Puchong. It has been more than a month since the election - I hope Gobind will update us soon on what he has been working on for the benefit of Puchong residents. I welcome him to world of blogging. p.s. After a long time, I realised that the DAP website has been finally updated with the latest MP list and more importantly with their respective email addresses. Rocky, i viewed the blog. I don't think Gobind himself is authoring the said blog. His supporters kut?? All at Riong says you wanted to contest the GE too Rocky. Thank you. I could sense your concern for me in the tone of your comment. Those boys at Riong told you that? They must be wishing I was a bankcrupt, Anon. Truth is, I have no experience being a bankcrupt (and don't wish to), but someone who once was declared a bankcrupt (he stood guarantor for a businessman once closely linked to a top politician; when that businessman left the country after that politician was jailed, this person I know could not pay and was declared a muflis) told me that when they declare you a bankcrupt, they bar you from travelling overseas, among other things. Me, I just got back from Singapore the other day -- check my postings. Unless those boys in Riong consider Singapore home and not overseas .... you know what I mean? i am so wondering why those Riong boys (for the life of me I don't who the riong boys are -- syed faizal, kali, kamrul idris, lionel bantut morais...who? who? who?) are so insistent on spreading talk that you are a bankrupt. i know you cannot be as rich as Kali. But then you earn duit halal..
last i was told (by your lawyers) that you have two houses, three cars and three wives (haha...this will get Kali all geared to get juicy details) under your name. Kali really thinks he's made a bankrupt out of you. Hey....please tell the NSTP board to STOP the company from paying his legal fees..Kali the CHEAPSKATE. hihiii...lucky fella...anak borek bapak...hihiii...kecik-kecik jaga lembu ...sudah besar bai juga..
Ah...its always mysterious that sometimes u see top people being declared bankrupt by courts only to have that overturned the next day. Just like how an ex minster was charged with groping someone. The power of money, or the power of power? u tell me. The March 8 elections results are hopefully a precursor to change that is likely to take place in the coming years in the fault line of Malaysian politics. The ruling coalition, the Barisan Nasional (BN, National Front) suffered defeats of historical proportions although it continues to govern because of majorities in Sabah and Sarawak. The results were anything but the clear mandate that Prime Minister Abdullah Badawi had hoped for. Some analysts saw this voting as a referendum on his leadership and popularity, which has been hurt badly by higher living costs and rising racial tensions in this multiethnic nation. When Mr. Abdullah assumed the office of prime minister in 2003 from charismatic Mahatir Mohammad, he appeared as one who was honest and determined to fight corruption and change the course of politics in the country. While he did take some cosmetic measures to fight corruption in the initial stage and made a break from the past policies of awarding government contracts to the government’s cronies, in the end it turned out that his style of functioning was little different from his predecessor. The ruling coalition finished with 62% of the federal seats—down considerably from the 90% that it had previously. Whereas the BN held 199 of the 219 seats in the earlier parliament, its strength this time is reduced to 137 seats, including eight won uncontested, far less than the two-thirds majority line of 148 seats. The loss of its two-thirds majority in the federal parliament which it held continuously for 34 years and bulldozed every decisions of the government down the throat of the people, together with the five states—Penang, Kedah, Perak, Selangor and Kelantan—out of a total of 13 going to the opposition, this will automatically put checks and balances on the functioning of government, and will impinge on the working of centre-state relations. The parliament now is expected to be more assertive vis-à-vis the executive. With 82 opposition members of parliament out of the total 222 seats in the Dewan Rakyat, the government will find it hard to push constitutional amendments through with ease as in the past. Bills now will be subjected to greater scrutiny, more so if the new symbol of opposition, Anwar Ibrahim, who was barred to contest elections until April this year, comes back to the parliament at a later date through by-election in a seat vacated by his wife. Mr. Anwar’s fledging party, the People’s Justice Party (PKR) won 31 parliamentary seats outperforming its much older and more experienced coalition partners, the Democratic Action Party (DAP), and the Partai Se-Islam (PAS). His expected re-entry into parliamentary politics as an opposition leader will surely bring some qualitative changes in the tenor of debates and in the nature of democracy in the country. He worked tirelessly to unify the opposition parties of the PAS and his own PKR and the rewards are already visible in the results. By acting as the middleman and rallying figure between DAP and PAS, Mr. Anwar was instrumental in bringing together people of various ethnic and religious backgrounds for the Bersih (clean) rally, encouraging Malay-Muslim voters who wanted to move away from ethnic-based politics but was still hesitant to vote for a non-Malay-led party which they might not identify with. Malaysia’s “unitary character with federal features” is also likely to undergo changes with the five “opposition states." These states are expected to assert themselves in all areas where the constitution confers on them legislative, executive and financial autonomy. Earlier, it was only Kelantan, which was controlled by PAS and one heard of step-motherly treatment by the federal government towards the state. But now with four other states, they will mount vigorous campaign for greater decentralization and autonomy, heralding healthier and fair relations between the federal government and the state governments. The results also showed a dent in the traditional race-based politics operating in the country ever since its independence. Issues of ruling coalition’s use of phantom voters and postal votes, corruption, price-rises, racial discrimination and socio-economic grievances played more important role in the voter’s choice for the party than their affiliation and loyalty to their races, as reflected in the total rout of the Malaysian Indian Congress (MIC) and its long-surviving and corrupt leader, Samy Vellu. Some Chinese politicians and cabinet members suffered the same fate for their inability to take care of the interests of the minority. This is a clear sign that race-based parties can no longer automatically count on the votes of their own community. This is true of UMNO, the Malay party, as two of Mr. Abdullah's former cabinet members lost their parliamentary seats. This has led to new political alignments in the country with the opposition parties like the DAP, PKR and PAS benefiting from this shift. Interestingly the decision by PAS to leave its Islamic state agenda on the back burner, and promise to establish a Negara kebajikan (welfare state) together with its fielding of a non-Muslim candidate to capitalize on ethnic minorities’ discontent with the current administration, facilitated this political alignment and the increase of its tally both in the parliament and in the states. Finally, the results have shown the power of the Internet and of short messaging, or SMS, in the dissemination of alternative sources of information, which neutralized ruling party’s overwhelming control over the conventional media. Mr. Ghoshal is senior fellow, Centre for Policy Research, New Delhi.